Your animal sightings shouldn’t be just limited to the glimpse of foxes rummaging through your bins or a neighbour’s sour-looking cat. 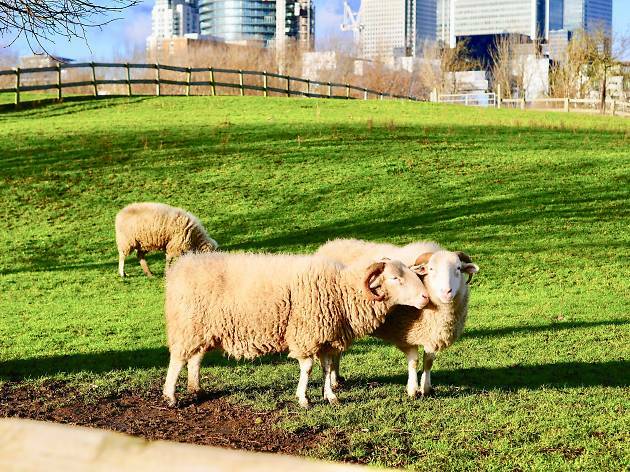 From Shoreditch to Surrey Quays, London actually has a surprising amount of city farms for you to visit. 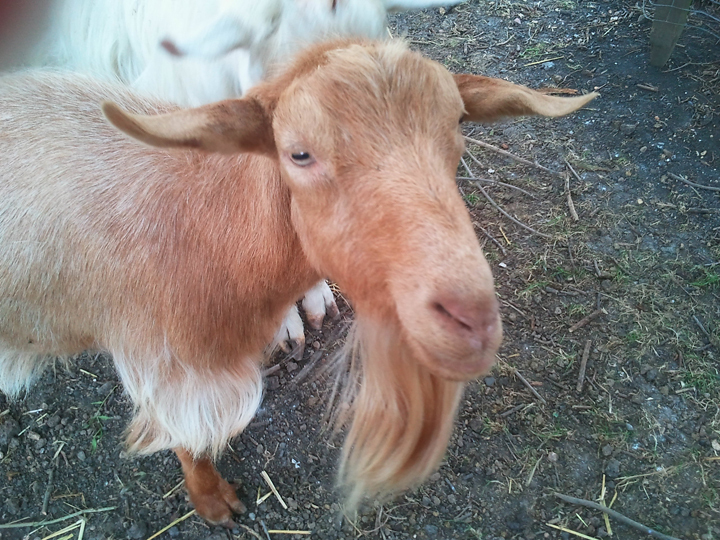 There are lazing llamas in Canary Wharf, energetic goats in Kentish Town or rare breed sheep off Holloway Road. A lot of the farms have hands-on activities and workshops – so if you’re in the mood to muck in and get your hands dirty, you can. It’s the perfect opportunity to get to see how the farms are run, get up close and personal with the cute creatures and learn how they’re kept happy. Many host events as well, like the annual Oxford v Cambridge Goat Race and, if you can’t wait all year, pig racing, which happens weekly at Hounslow Urban Farm. 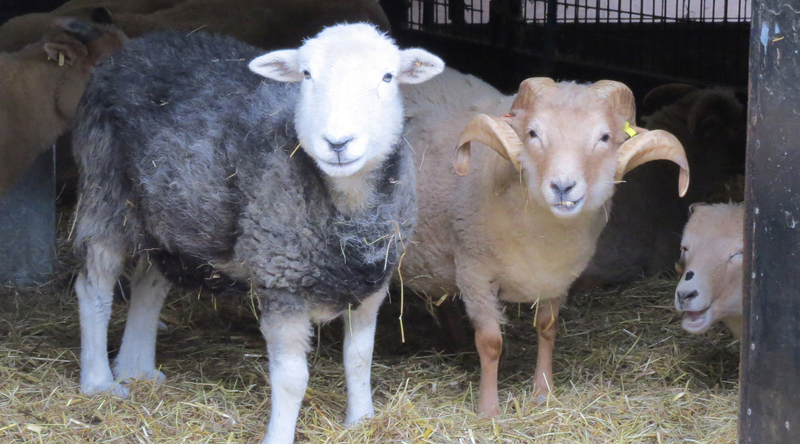 So whether you’re after something to keep the kids occupied or you just want to coo over the animals yourself, here’s our roundup of the best city farms to visit. 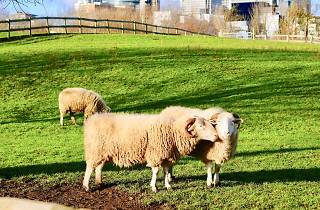 One of the largest farms in London, Mudchute Park and Farm covers 32 acres in the Isle of Dogs. The farm itself is surprisingly compact but full of animals, many out in the fields. 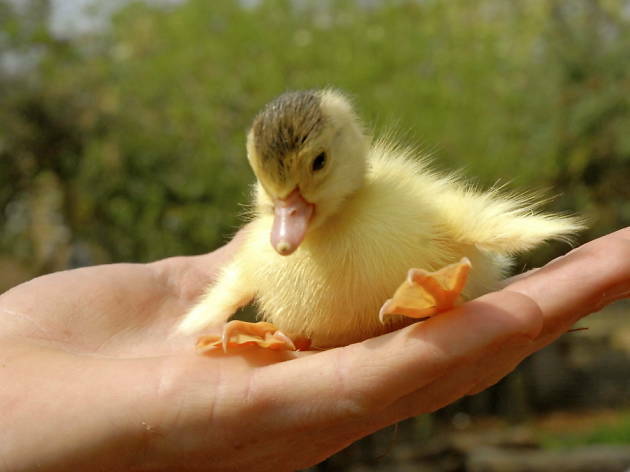 Plus there's a petting zoo and duck pond. The focus of the park, though, is the thriving Equestrian Centre, a riding school for all ages with an all-weather floodlit riding arena, show jumps and cross-country fences across the many acres. However, if this sounds too adventurous, just bring a picnic to enjoy in one of the many green fields, watch the horses trot by and pretend you’re in the countryside. Anything else I should know? There's no visitor parking so travel by public transport if you can. Most areas of the farm are accessible by wheelchair but some paths can get muddy. 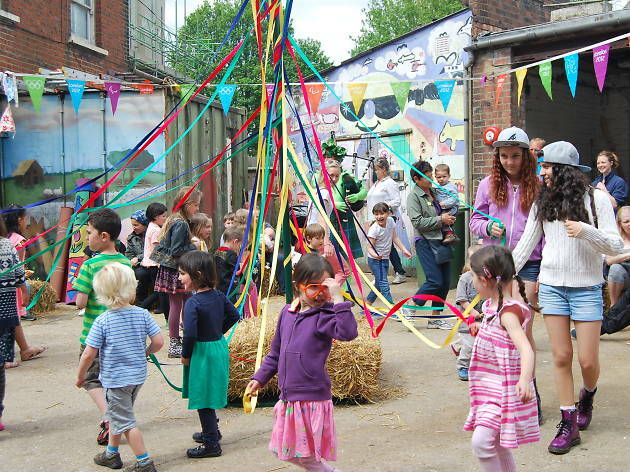 In what used to be a brewery, Hackney City Farm is nestled on the busy throughway between Broadway Market and Columbia Road. It's become a fashionable stop-off for ambling weekend marketgoers, thanks in a large part to its Italian café, Frizzante, which serves hungry Hackney folk fresh seasonal Mediterranean cooking and tasty farm breakfasts. The café may be a big draw but the rest of the farm is thriving with happy animals, a pottery studio and garden. The farm is a vital community hub with a vegetable box collection scheme for locals, courses on low-impact living, beekeeping and practical courses for asylum seekers and refugees. Anything else I should know? Disabled parking can be arranged if you phone and book in advance. A member of staff will also assist anyone who would like more help to access the farm. You can also up your green credentials by cycling to and from the farm (there's a bike repair and service centre on site). 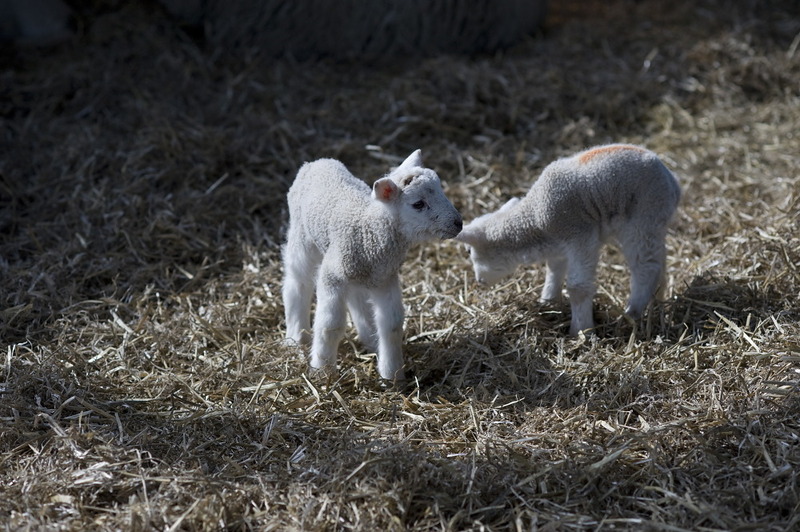 Set on part of the National Trust's Morden Hall Park Estate, Deen City Farm provides south Wimbledon with a healthy dose of the countryside. 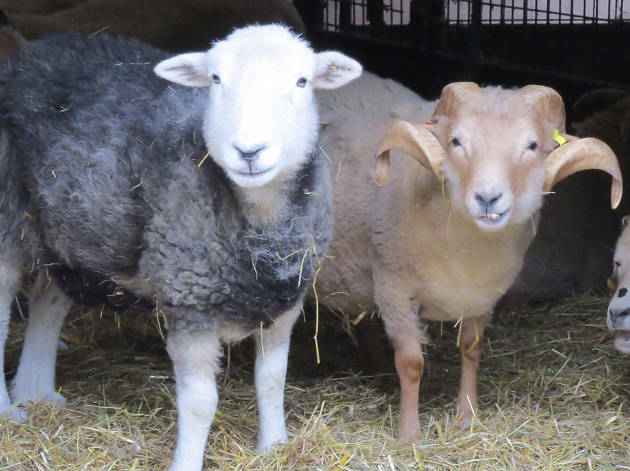 Meet the farmyard residents like Kimby the alpaca and Edna the barn owl, buy grass nuts to feed the animals or squeal over the newly born ducklings, chicks and lambs. Anything else I should know? The farm, fields and stable yard are largely wheelchair accessible, and there's a volunteering programme you can get involved in if you're left wanting more. 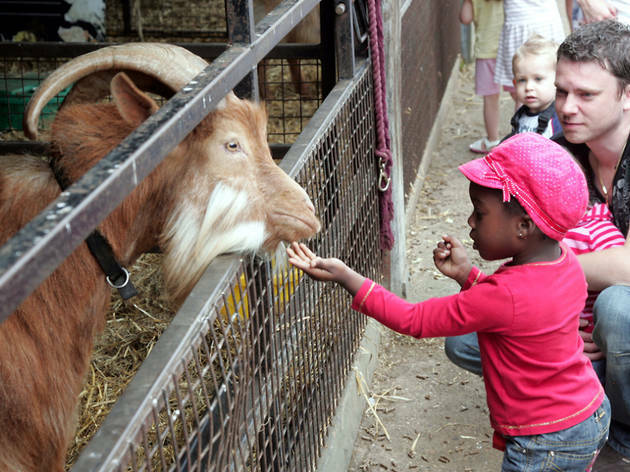 Spread over 29 acres, Hounslow Urban Farm is one of London’s largest community farms and is a fun day trip for families from Feltham and beyond. Take a stroll around the paddocks, feed the wide range of farm animals (including pigs, goats, cows, rabbits, ducks, geese, alpacas, chipmunks and rheas – flightless birds), or have a picnic and catch an owl display. Oh, and whatever you do, don’t miss the weekly pig racing (yes, really!). Anything else I should know? There’s free parking onsite. You may be surprised to find this compact farm just off the busy main Vauxhall junction, but it has managed to pack in a range of animals, a duck pond and an ecology garden (complete with bog, wormery and stag beetle nursery). There’s also a community allotment, which grows plants used as dyes for the wool spinning classes that take place on the farm. There is also a riding school with a paddock, which is probably the only place you can keep an eye on MI5 while out for a gallop. Anything else I should know? It’s fully wheelchair accessible and only a short distance from Vauxhall tube. Price: Donation-based, suggested amount being around £3. Built in a former railway goods depot, this farm is an urban oasis just minutes from the bustle and electricity of Brick Lane and Shoreditch. 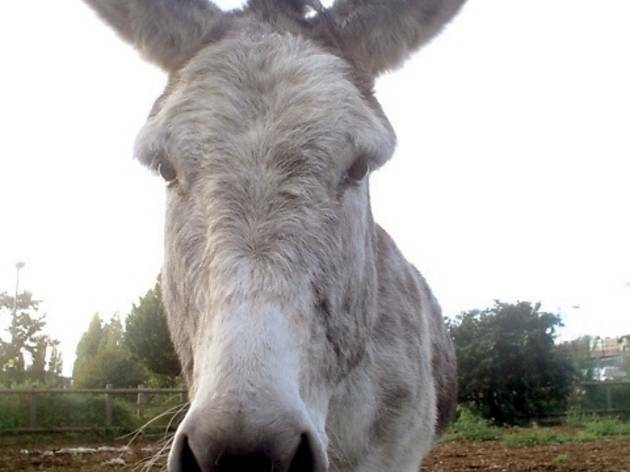 So when you tire of rummaging for vintage clothes and have picked up the obligatory bagel, stop by and visit characters such as Bayleaf the donkey and Bentley the goat, or pick your own veg. Anything else I should know? It's easy to get to from all types of public transport, but there is also some patches of free parking to scout out. Also, don't miss the annual Oxford & Cambridge Goat Race. Nestled on the Thames Path in what used to be a smallpox and fever receiving station, Surrey Docks Farm is a rural delight only a few moments from the mayhem of Surrey Quays shopping centre. 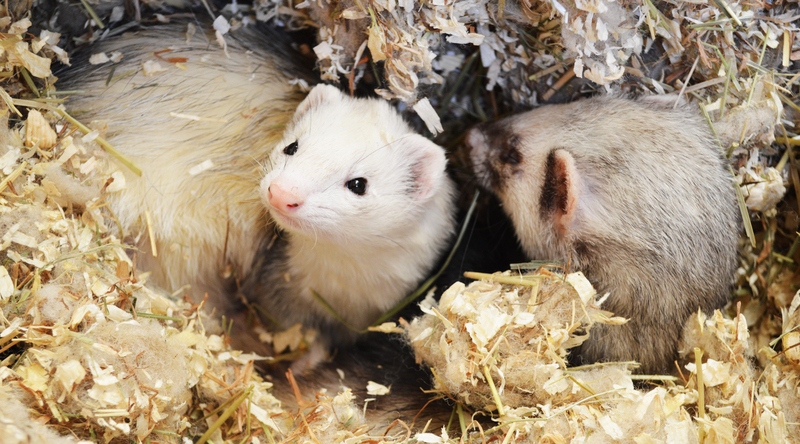 You’ll find cute animals, flourishing gardens and well-kept grounds. There is also the rather sweet Piccalilli Caff on site, which serves up some yummy grub. 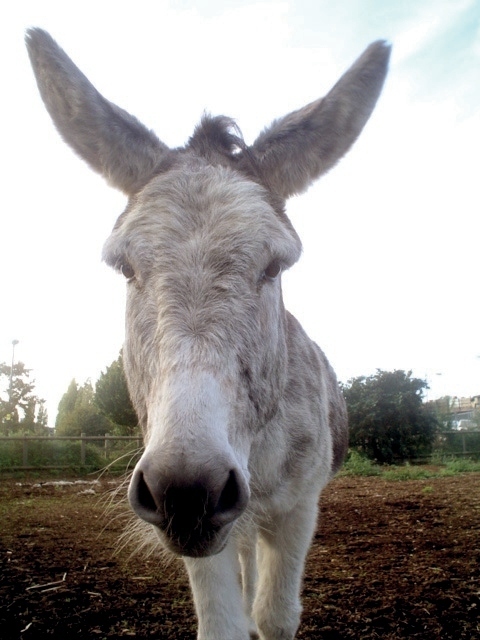 The farm is bustling and busy with regular donkey rides, allotment activities, a mobile farm and more. Anything else I should know? These guys are committed to their green mantra: they make compost from their green waste and generate their electricity from roof solar panels. 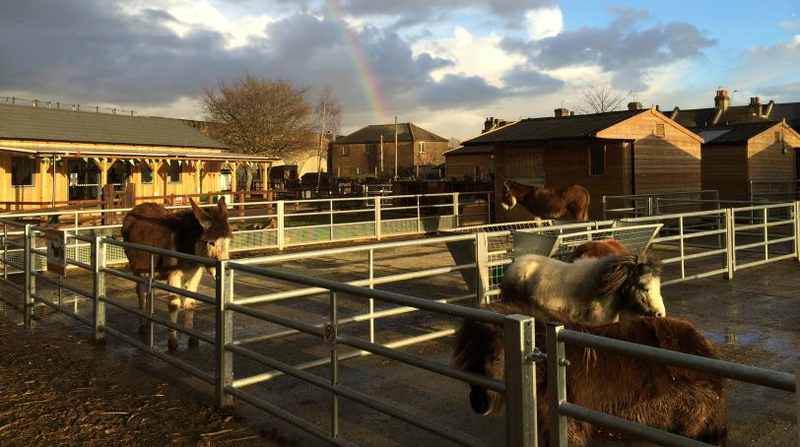 If you have ever been on the Overground and noticed horses near Gospel Oak station, you will have had a sneak peek at Kentish Town City Farm. Tucked in and around the railway, a treasure trove of wildlife unfolds as you explore: goats romp under brick arches, sheep bleat over the whirring of nearby trains and frogs croak in a lively pond. 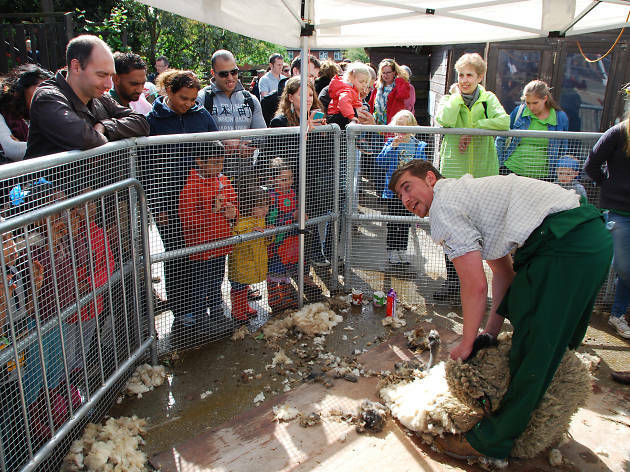 Children are at the heart of the farm, with a range of weekend workshops, an under-fives activity room and a dedicated team of local young volunteers. Anything else I should know? There’s free parking and easy access from Kentish Town and Gospel Oak stations. 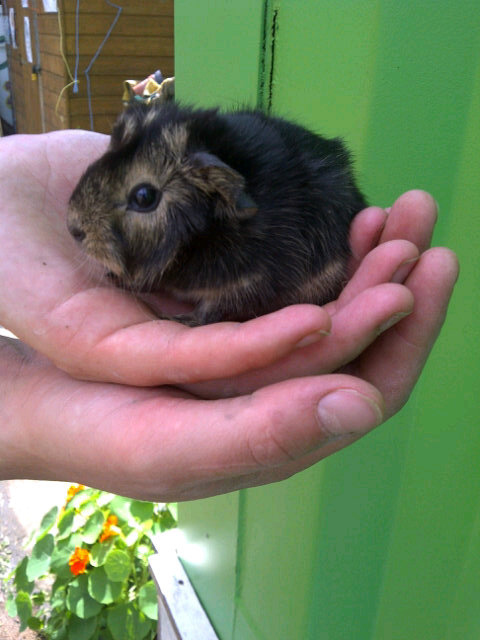 Oh, and it is London's first ever city farm. Cool, right? Best for: Post-farm grub – don't miss their award-winning café. 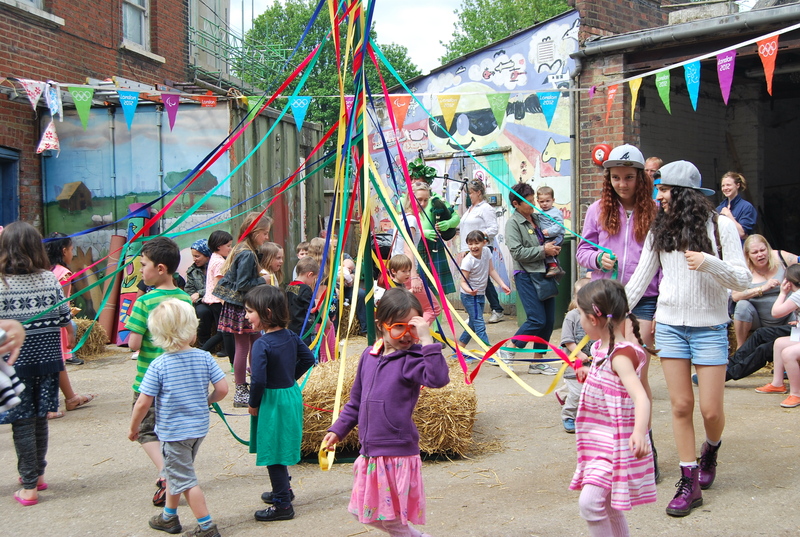 This farm has existed for 40 years, and now offers a green creative space for Stepney. Not only is there The Rural Arts Centre, but there's also a gallery that hosts classes. Really, education is one of the key pillars of this farm, which is reflected in all the activities: from community growing workshops to teaching pottery, woodworking and more. 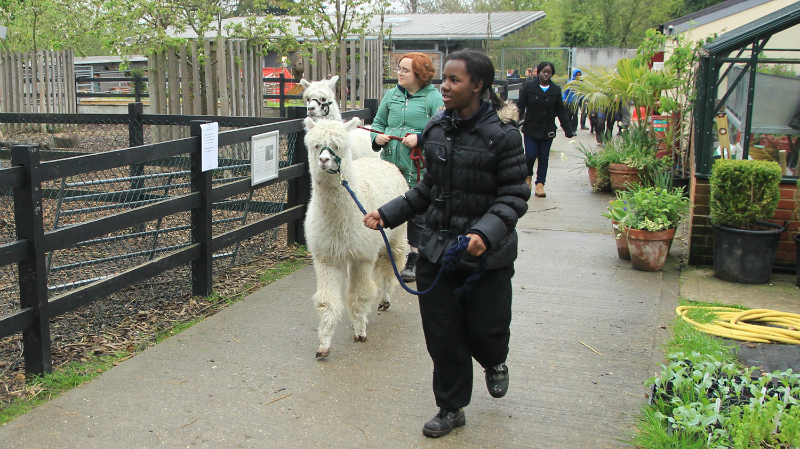 The farm's Furry Tales is an extra special initiative that brings together individuals from different generations and animals in a bid to tackle isolation and loneliness in Tower Hamlets. Anything else I should know? They've definitely got their eye on the green agenda - there's even a children’s garden constructed from recycled materials such as an old car and bathroom suite, as well as a greenhouse made from plastic bottles. 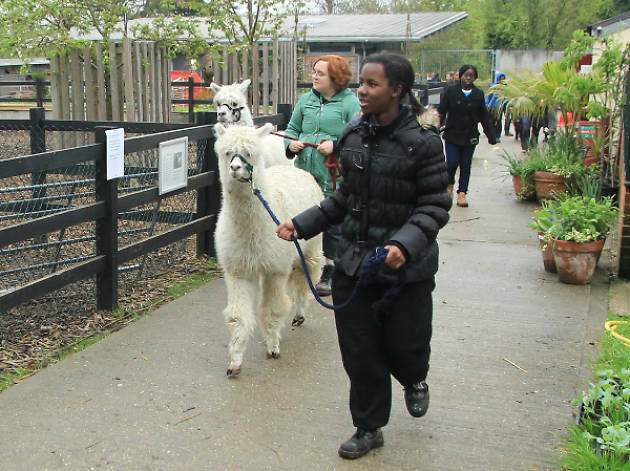 Situated in Leyton and a part of Capel Manor College, Brooks Farm has been a staple of community life for over 20 years now, providing inner-city kids a chance to get up close to animals and learn farm-based skills. Animals here include sheep, donkeys, ponies, goats, rabbits and hens, and you're encouraged to walk around at your own pace and meet them all. 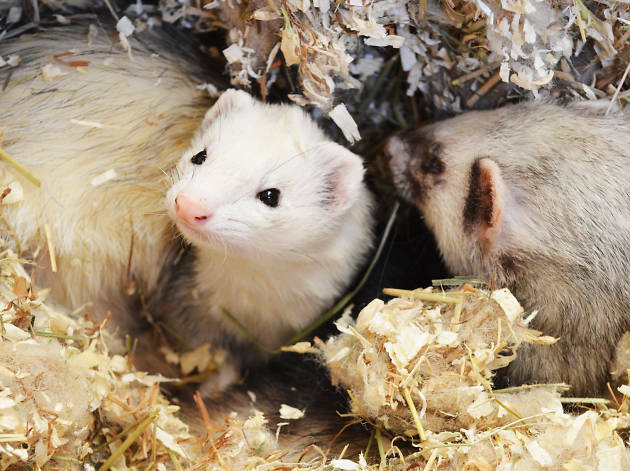 There's even animal feed available so you can make some furry friends. Anything else I should know? There’s no parking onsite, so if you can take public transport. Best for: Awesome themed areas. Think Dino-chicken World, the Meerkat Lookout and Rainforest Retreat. Comprising of two farms, Hayes Hill and Holyfield Hall, Lee Valley Park Farms features vegetable plots and plenty of opportunities to see animals large and small – including cows, pigs, chickens, rabbits and guinea pigs. For utmost excitement, there's soft play on offer in the Bundle Barn, while the Hilltop Adventure Zone includes a spider climbing tower and a giant jumping pillow. Anything else I need to know? Be sure to check their website for special events on that day, and if you have the time do also hit up the nearby River Lee Country Park for walking trails and more wildlife watching. 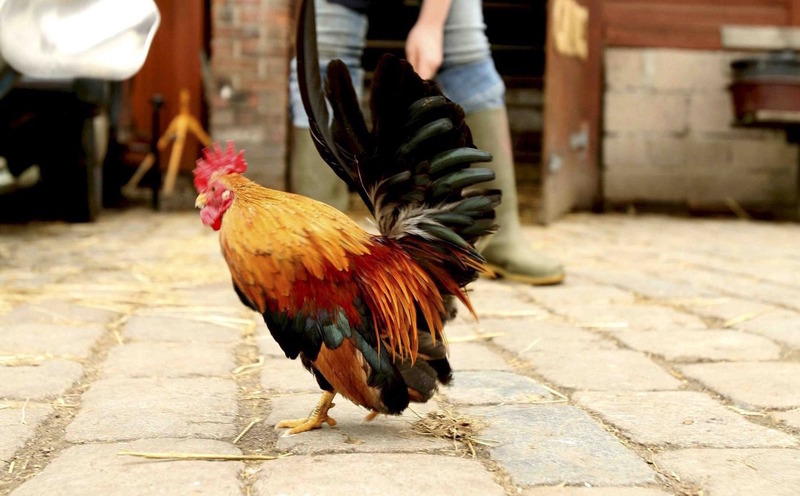 Across 89 acres, this working city farm gives visitors the chance to see the inner workings of a farmyard and an opportunity to get up close to native bird species, butterflies, wild flowers and woodland. 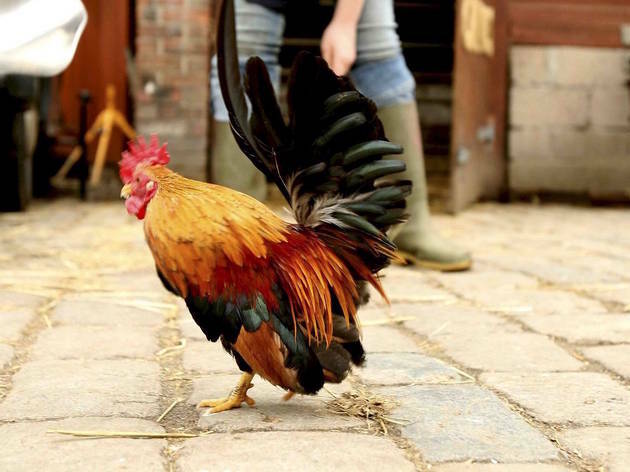 Awesome events at the farm include themed walks, activities such as shelter building and sparrow spotting, and their annual barn dance, which takes place in an actual hay barn. Anything else I should know? It's best to call ahead if you're visiting in a group larger than 10 people, as there is likely to be a fee. Parking is also limited, so travel by public transport if you can. Best for: Locally-produced farm produce. Yum. 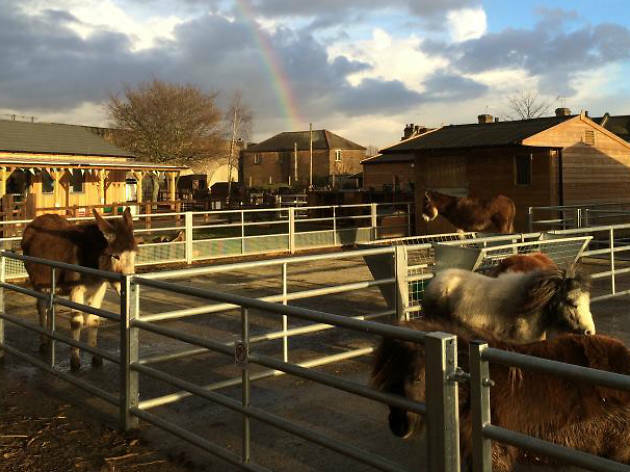 Islington’s small community-run farm is battling against large government cuts but is determined to keep afloat. Hidden behind Holloway Road, Freightliners is a vibrant hub of wildlife with a wide range of animals. Strawbale Café, a great vegetarian café with tasty daily specials is a must-try, housed in a volunteer-built eco-building. 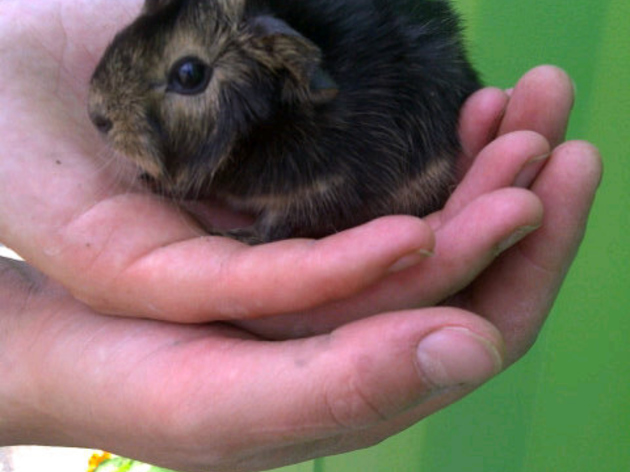 There is also a small petting zoo, bee hives, vegetable gardens and even animal boarding for local pets. Make sure to stop by the shop to pick up some homegrown honey, eggs or veg too. Anything else I should know? Their super sustainable vegetable gardens supply the Strawbale Café, these guys are all about minimal waste. 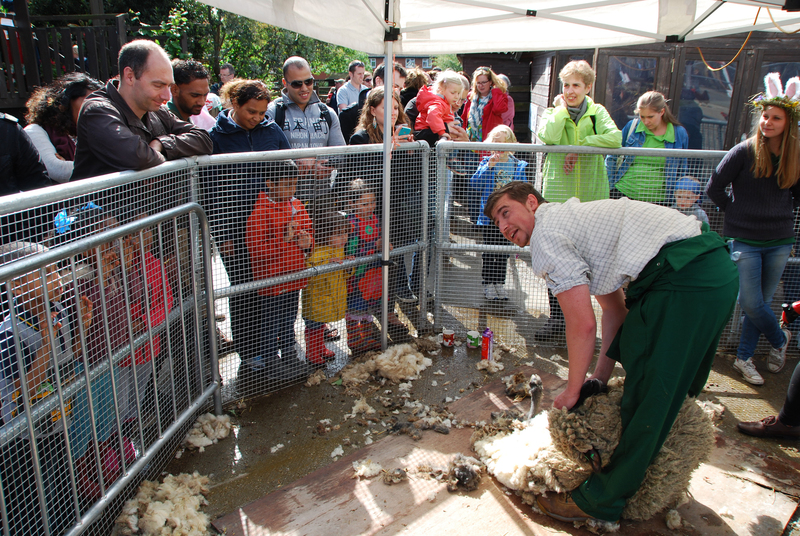 One of London’s oldest and largest city farms, Newham has been here for over 30 years now. Alongside the usual farmyard fare (poultry, sheep, pigs and goats) is the largest animal on the farm: Blaze, a shire horse, who pulls a dray cart that visitors can ride in. There are also some smaller, furrier chaps (rabbits, guinea pigs and two ferrets), a twittering house of finches and Sarah the barn owl. There's also a play area for toddlers with ride-on toys and a recently built covered outdoor learning space that doubles up as a picnic area. Anything else I should know? It's easy to get to by most modes of public transport, which is probably your best bet as there is limited parking. 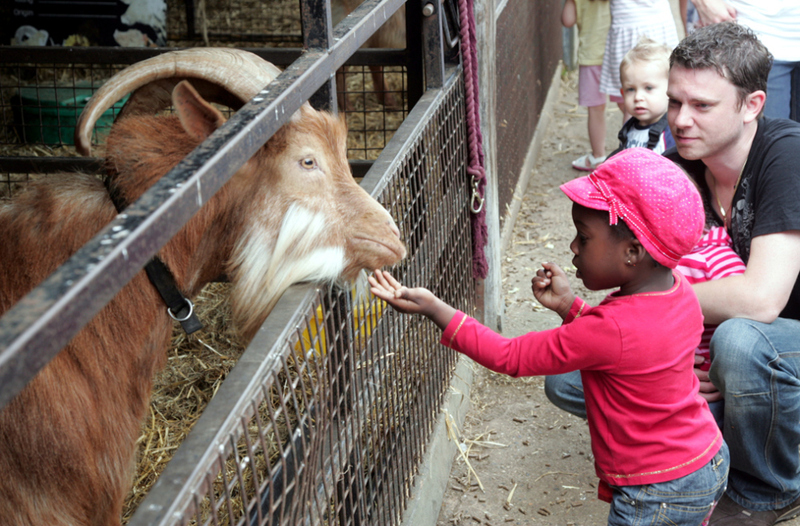 Crystal Palace Park Farm is very much a community-focused centre and well-used by local schools, who get guided tours with an education officer. In the small yard and paddock, there are kunekune pigs, alpacas, goats and Shetland ponies, while the smaller animals are up a steep ramp. Children are always fascinated by the reptile room, too. 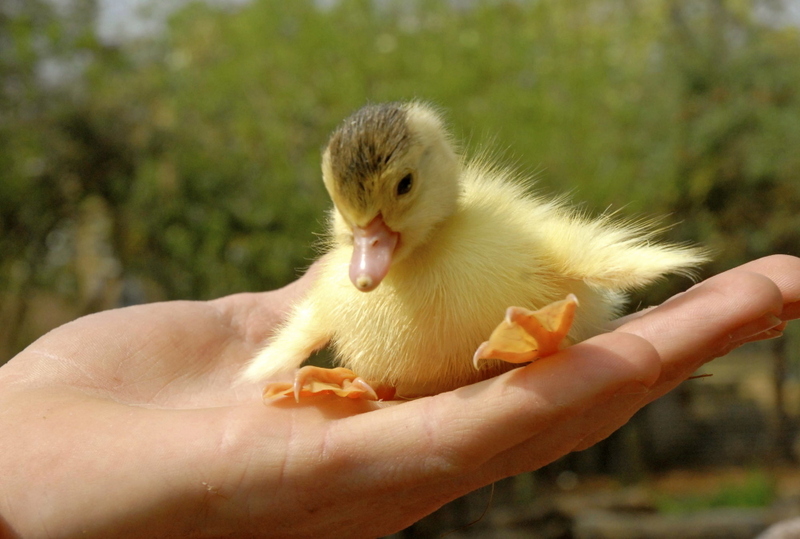 In the afternoons, casual visitors can often handle the smaller animals, if there's a free member of staff handy. Anything else I should know? 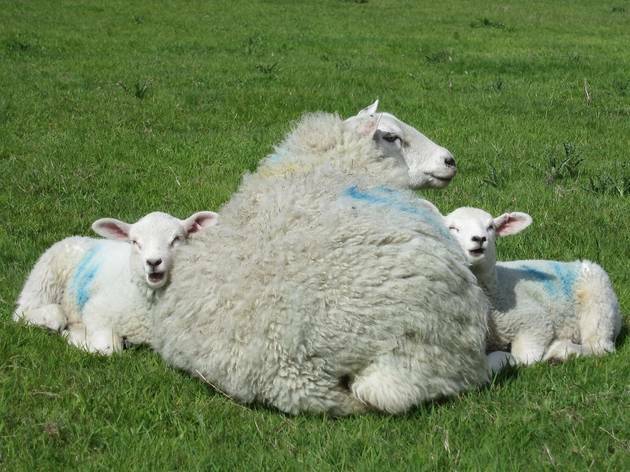 Thanks to the London Overground line, it's really easy to visit this farm. It's a stone's throw from Crystal Palace station. Despite only being open for a few years, Belmont Children's Farm's mission to become a farm for the community seems to be working as it's already become a wildlife hub for Mill Hill. 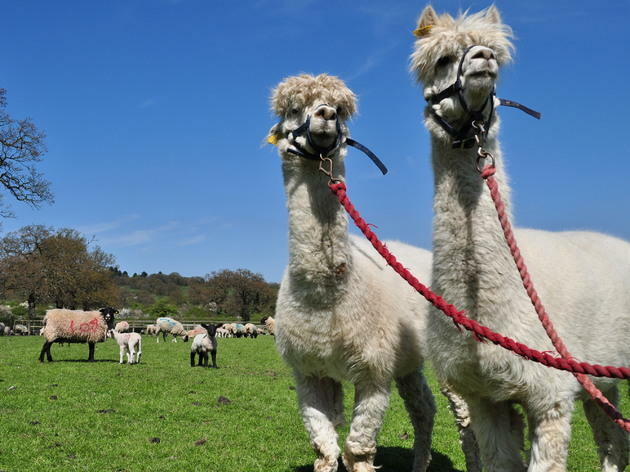 The farm is home to the usual range of animals but also boasts rare breeds and more exotic cratures, such as alpacas, storks, wallabies and snowy owls. 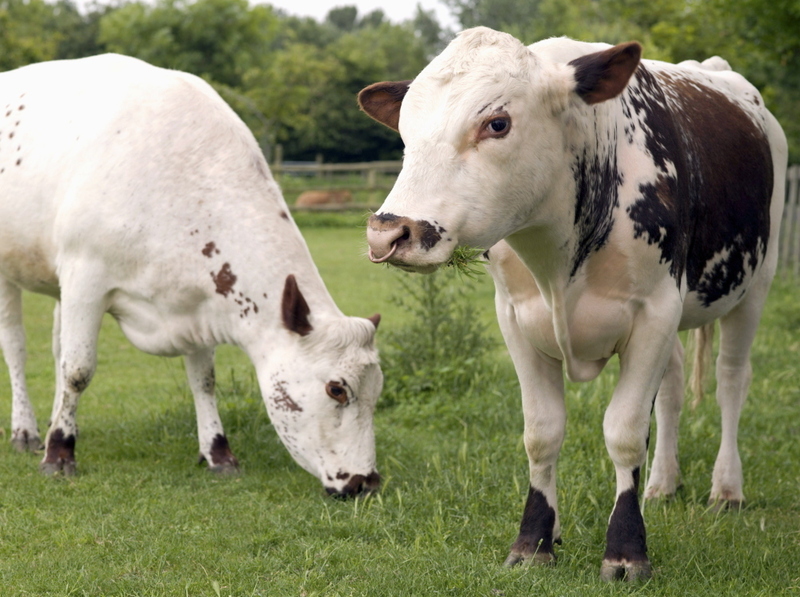 You can take a tractor ride around the farm, feed the animals and, at 10am every day, you can meet their lovely herd of jersey cows and their calves. The attached café specialises in waffles, but you'll also find other food and drinks on offer. Anything else I should know? It's easy to get to, whatever your preferred method of travel – there's a decent sized car park and a bus stop right outside the entrance. Price: From £4. Children under 1 go free. 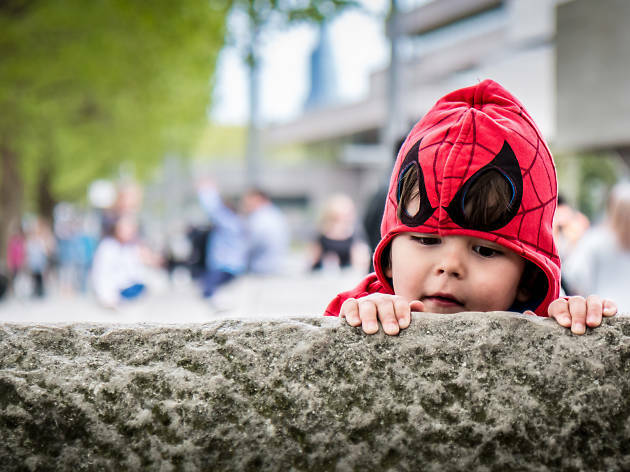 There need never be a dull moment in this city – London is jam-packed with fantastic experiences and days out for families and kids. 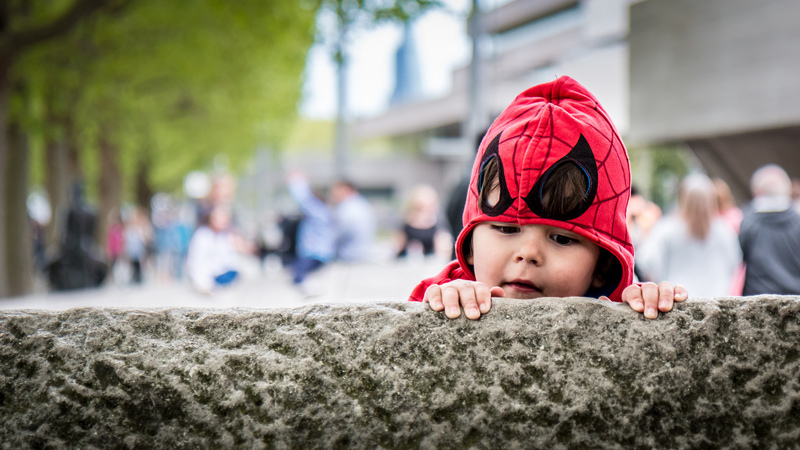 Here are 101 of the best things to do with children in London.